It's time. I'll be posting my favorite holiday recipes throughout the next couple days. Yum, yum, yum. Starting off, here is an incredibly addicting caramel popcorn recipe. You may think, "Huh, CARAMEL POPCORN....whooopdy doo!" But I'm telling you, TRY IT!!! I call it *Chicago style* because when my digi girls and I went to Chi-town this fall, we got some similar stuff at a famous popcorn shop there. (Girls, what was that place called again?!) But this recipe is even BETTER! I'm packaging it up in little vintage looking popcorn boxes and taking it to neighbors. More baked sugary goodness coming soon. Oh, and a quick tid-bit from today. I ran into Walmart to grab some groceries (Why on EARTH I went to Walmart is beyond me! I DESPISE that place!!) and quickly popped into the holiday section to see if anything was decent. I found the CUTEST glass cloches housing little glitter mansions. OMGOSH, I almost died!! I'll have to take pictures of the new collection. You'll love them! Kim, I really should make your blog one of my Firefox homepage tabs. I always feel SO inspired just visiting here! Yay for recipes!! 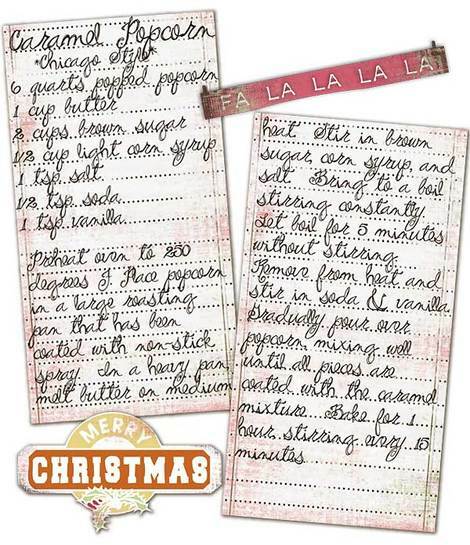 I am going to try out your sugar cookie recipe tomorrow and I can't wait! This popcorn may be next on my list! I think that's Garrett's on Michigan Avenue... is that where you went? Every tim I go by that place, people are lined up outside the store, right onto the sidewalk, just waiting! Must be good. OMG what font is that? Yum! I want to be your neighbor! And I have to agree with Shannon B. I can't help but feel inspired checking out your blog. Okay, got carried away there. LOL Anyway, if I don't catch ya again before have a blessed Christmas with your family. ooh.. I love new recipes!! Thanks so much for that delicious recipe, Kim! I just love caramel popcorn!!! Kim, I adore you for many reasons. I adore oyu even more for knowing what cloches are! I'm dying to see what you bought. I saw some at Target too, but my I'm over budget on holiday shopping.